Hi there! I posted up a picture of this plant back in the Spring with no luck on identifying it. It now has flowers and may be easier to figure out, I still have no idea what it is...can anyone help?! Thanks! Was this found growing in Ireland, Is the main stem square, What colour are the flowers are they composite. Are the leaves opposite,is the stem hairy any scent from the flower, when was the photo taken, is it the only plant in the location, Did you buy it, any other info you can give could help. Thank you for the new very clear pics. This has appeared twice recently on other forums. Both people had bought it on e bay as a Venus fly trap, which very obviously it is not! See other thread here, with pics of the young imposter! Is this growing in Ireland. Where did your friend get the seed. My first thought was Burdock which its not. I think it could be in the Lamiaceae family, thats where im looking at moment. 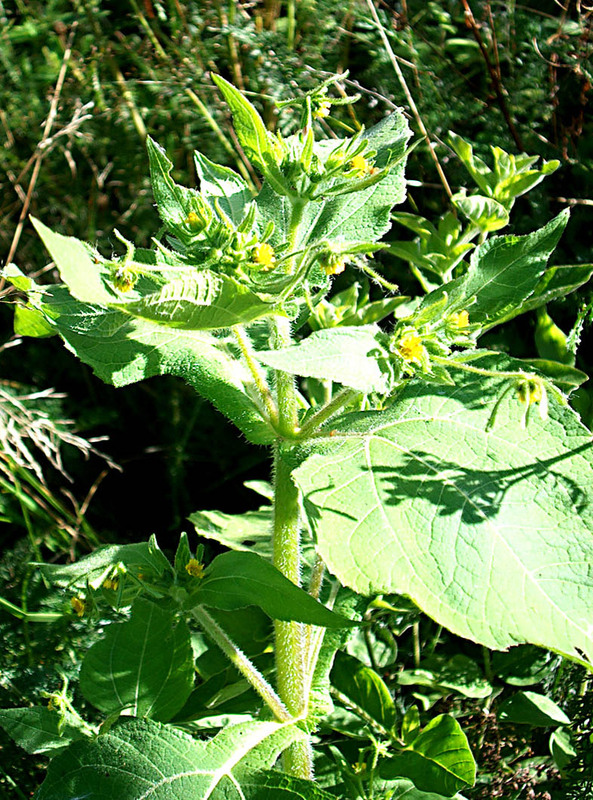 Could it be a herb related to the Balm. Err! I thought I had id the plant as Sigesbeckia serrata. See above! Excuse me greengage but did you look at the links I posted? Yes i looked at your links, But no picture of the plant overall, the flowers look like it but I would like a definite answer as to what it is. I now suspect that it is Asteraceae family possibly of Australia. I will forward your links to my sources and see what the come up with. "Sigesbeckia serrata, native to South America, introduced in Germany (Hamburg) at least since 1920." "Tribe: Heliantheae. Genus: Sigesbeckia. Sigesbeckia is a genus of annual plants in the aster family. " Well done you are right , How did you figure it out from the pic. Have you seen this plant before.